Ready for week 16 of the 52 Photos challenge? add a photo that fits the theme to this week's free-space gallery. If you use a social network (Facebook, Instagram, etc.) 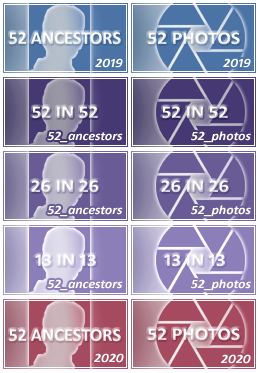 please share the photo there as well, using #52photos and #wikitree. This can be a great way to involve more family members. If you use a blog, include a link to your blog post in your answer below so we can all read it. Members who participate every week can earn challenge badges. Click here for more info. If this is your first time participating, or you don't have the participation badge please post here. We are not tracking who posts each week so when you pass a milestone (13 in 13, 26 in 26, 52 in 52) you need to let us know by posting here. Susan, you always have such wonderful photos. And how nice to be able to make the bird a friend. Thank you for sharing this photo. Having food is always a great way to make friends, with people and animals. I love seeing your fascinating photos. This is a great photo Susan. How gentle she must have been to attract the birds to land on her. Love it! 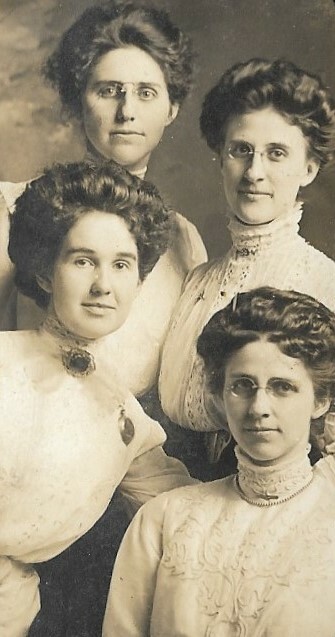 This is a photo taken about 1905 of my grandmother, Pearl McCleery, lower left, with her three girl friends. These are her same three friends that iin Week 13 were dressed as men just to be funny. The two on the right are sisters, and the lower one is also named Pearl. Lovely photo. The details in their dresses and their pins are gorgeous. Thanks for sharing this Alexis. Thanks Susan, they look better as ladies! Thank you Caryl, I have the pin and watch she is wearing, since I am her only grandchild. These are a special group of ladies and they look so good as women. I, too, remember the funny photo. I love their clothes and you are so fortunate to have your grandmother's pin and watch. Thank you for sharing this photo. Love this picture of your grandmother. I also remember their picture as men, and they are lovely in their natural state. Their hair is so beautiful, pins are awesome, and I notice that glasses like they are wearing are coming back in style. Thanks for sharing this picture. Thank you Robin for your nice comment. It looks like this photo was taken at a studio, as the quality is much better. Thank you Cheryl, wish I had inherited the good hair. Great photo! I have one somewhat similar of 4 ladies, two sisters and two cousins but they were in dark clothes and were going for the Darth Vader look. 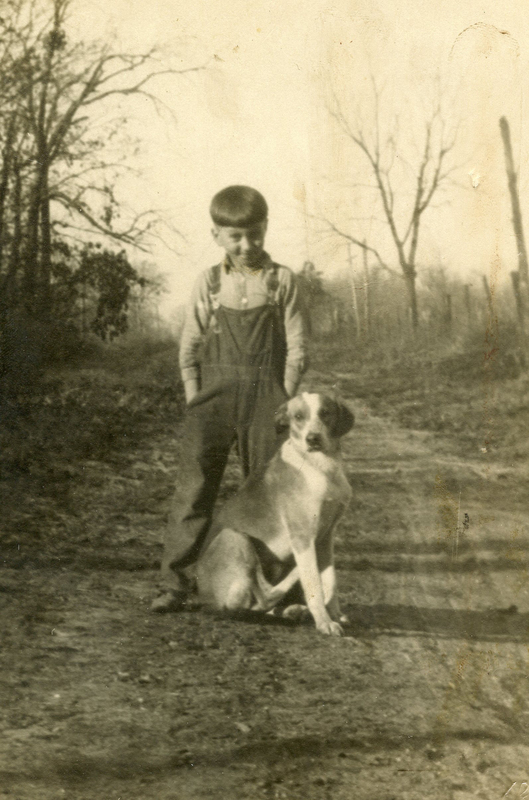 The age-old friendship of a boy and his dog. This is my granddad. What a great expression he has on his face. Love the dog! Thanks for sharing this Randall. I bet if the dog stood up, he would be taller than your grandfather! Wonderful photo, the dog looks very smart and knows he is getting his picture taken. These were friends of my great great grandparents taken at their home in Oakland, California about 1910. Thanks Susan for your kind words. They did enjoy playing music with their friends. It seems like life moved a bit slower then. I am little envious. 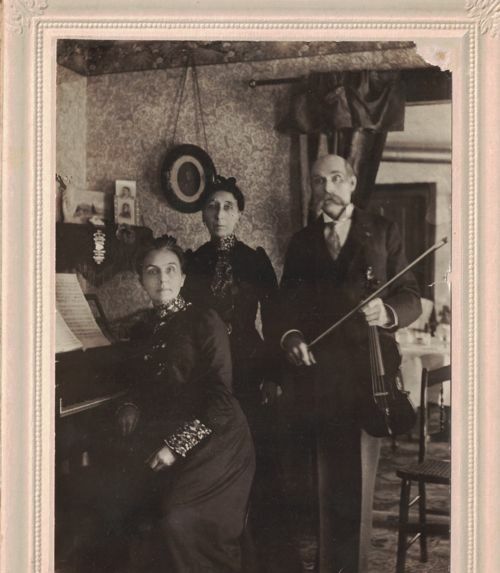 I wish I could see what family members were in the pictures on the piano. This is an awesome family photo, with family photos in the background. Sure would like to know how they hung that long picture. Do you think people back then were really dressed up all of the time? They have the same type of wood that we have in our home. I can see from your picture how they hung the curtains between the rooms now. Thanks so much for sharing this picture! Thanks Cheryl. I am not sure they were "dressier" than others of their time. GG grandpa was a doctor so they probably were better off some. From their granddaughter (my grandma) I learned that they were really devoted to service. They were active in their church and loved to play music so it could have been a Sunday afternoon gathering. I love the room too, so Victorian. I wish it was in color so we could see the details. Oh, Caryl - you read my mind. Our house was built in 1914, and used to be the Baptist parsonage of the church that we go to. We have tried to keep it true to the time period, without going overboard. That is why I was showing an interest in the way the picture and the curtain was hung, not that I would ever go that far. My step-father even gave us an antique couch, love-seat and chair that we have in the formal living room that fit the era perfectly. Thank you, again for your picture. 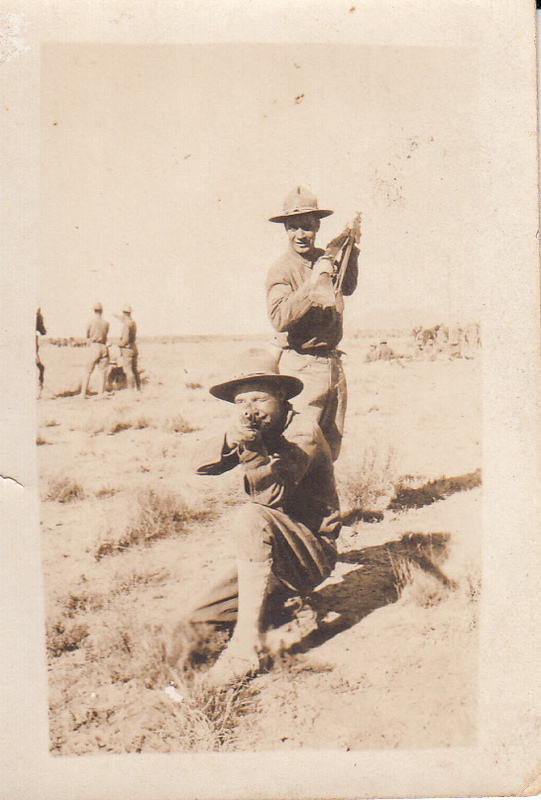 My great-grandfather, Jess Palmer, apparently had a fantastic time with friends training for World War I at Camp Cody in New Mexico. I'm pretty sure he's the one in the front here, in imminent danger from the stealthy guy behind him. I don't think he's in any of these photos, so he must have been the photographer. 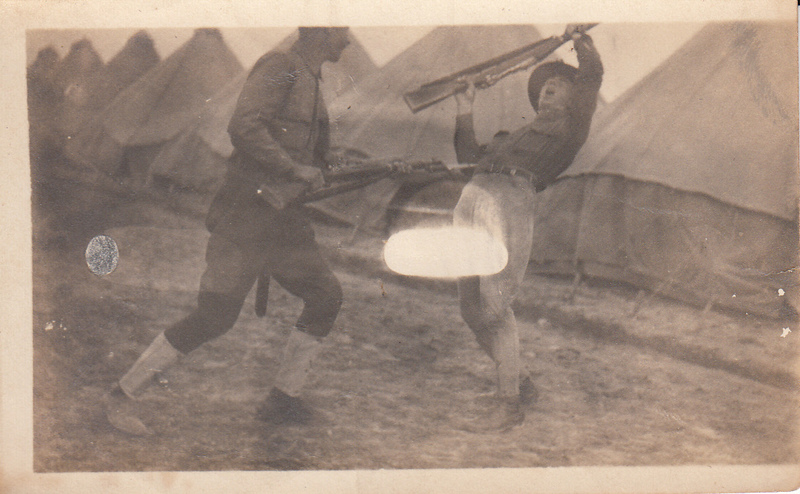 When he went overseas, he ended up joining a different division than the one he trained with, so I don't know if he fought alongside any of his friends from camp. And he was involved in quite a bit of combat, so I suspect his actual war experience was pretty miserable. But I'm glad he was able to have fun with friends while he was still in training. What fun they had. These are very special photos. Thanks for sharing. This is my mother, Alease Scott, and her friend, Imogene. Looks like Imogene's last name may have been Harris. I think this must have been taken in the 1930's when my mom lived in Virginia Beach, and worked at Fort Story. Both of them are beautiful young women, and looks like they have a great friendship. Also they have almost the same shoes. What a fun photo! That's funny.... I noticed the shoes, too! Must have been the big style back then. I see some like it now, too. The first thing I noticed was the shoes. I bet because they are white. I think it is funny, because the lady on the left looks to be wearing an outfit similar to what I had to wear in gym class. They are really having a great time. Oh I *remember* those "gym suits". Ours were white, and they had to be the most UNBECOMING things known to man (or woman). It didn't help that I was a gangly teenager with no curves, LOL. That ship has sailed. Lynn, that is funny - ours were an ugly color blue. One piece that snapped up the front. You had to have the perfect shape to look good in them. Thank goodness those days are over! 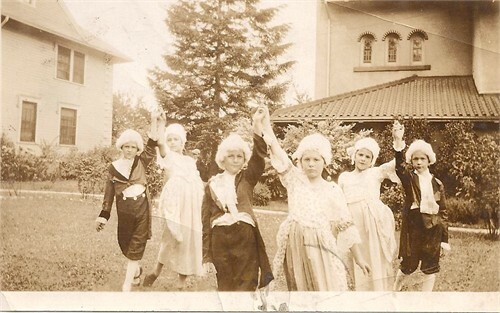 My grandmother Julie, second from right, rehearsing for a school play at her elementary school in Oregon in the early 1900's. They are dressed so cute. Are they supposed to be George Washington? It looks like his wig. They all look like they are enjoying themselves doing a little dance. The middle fellow is my eldest 1/2 brother, along with his best friends from high school and college. They still golf together, which is the least risky activity they have engaged in all these years! Oh, the trouble these fellows managed to cause when they were young! Fond memories! 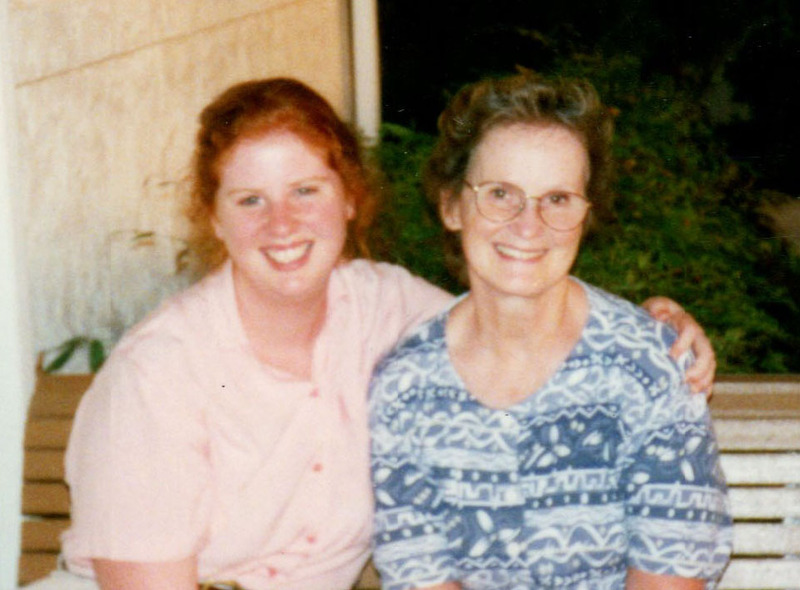 Here's a photo of my best friend and mother, Frances Lee (Peasley) Robinson and myself. Gotta go with the man's best friend angle here. 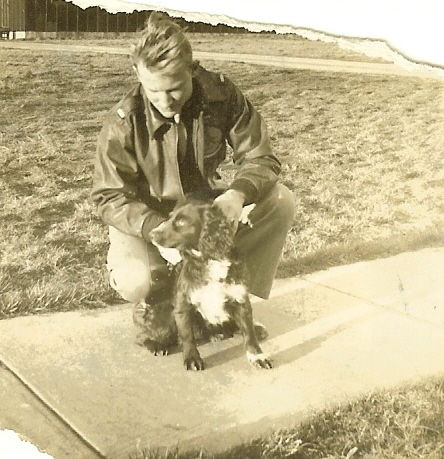 This is my grandpa and his dog, Flaps, who survived the war with him, eventually settling down into life in Florida. He loved animals, and my mom told me they always had about ten, in addition to all the other animals he and my grandmother would rescue after hurricanes, such as Porky the pig and Rufus the raccoon. My grandpa always had little sticky notes with a dog on them that read: "The more I know about people, the more I like my dog." He really was a great person, and an interesting one: an animal-rescuing plumber turned citrus grower. 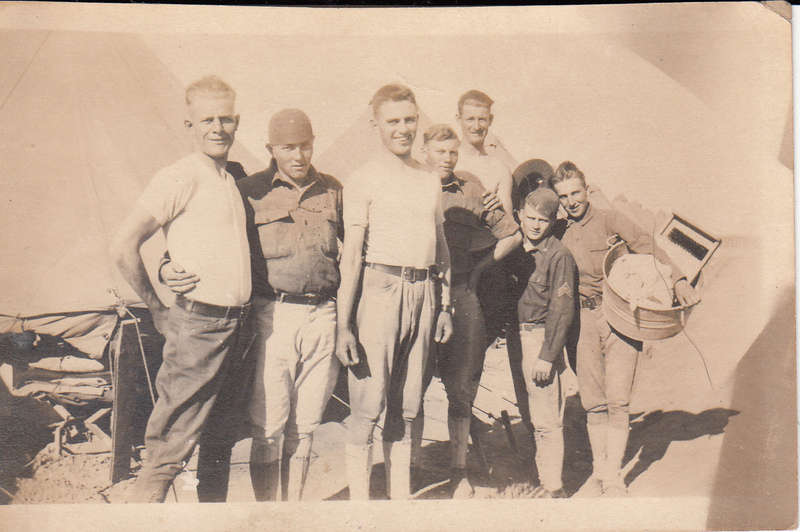 Flaps was really something special-my grandpa saved the pictures of Flaps that were taken during the war-all the men he served with really loved having a dog around and they all look happier when they're holding Flaps. I gotta agree with your grandpa. I like dogs so much better than humans! What a wonderful man to rescue all kinds of animals. If heaven exists - there's a special place for people like him there! a delightful picture to be sure. From your story, your grandpa must have been a wonderful person. It looks like your grandpa is wearing a military jacket. I am not sure from your story, but did your grandpa get to take Flaps home with him? Yes, Flaps did get to come home with him-the lucky dog got to settle in Florida; my granddad eventually got a house on a lake, which became the home of many, many dogs over the years. Flaps was my grandpa's first dog (and such a bright spot during the war years), so he was always extra special. Well, lets break this down. He's wearing a pilot jacket and Lieutenant Bars so he's either a pilot, co-pilot, navigator, or bombardier. When a plane comes in to land, you lower the back edge of the wings down to increase lift for slower speeds (landing speeds) - these are called flaps and you can't land (easily) without them. Now we know where the doggy got his name! All correct-he was a pilot and a lieutenant (this comment made me chuckle because his name/rank was literally Lieutenant Barr). Flaps also loved to fly (and had flappy ears), so the name was a great fit for him. 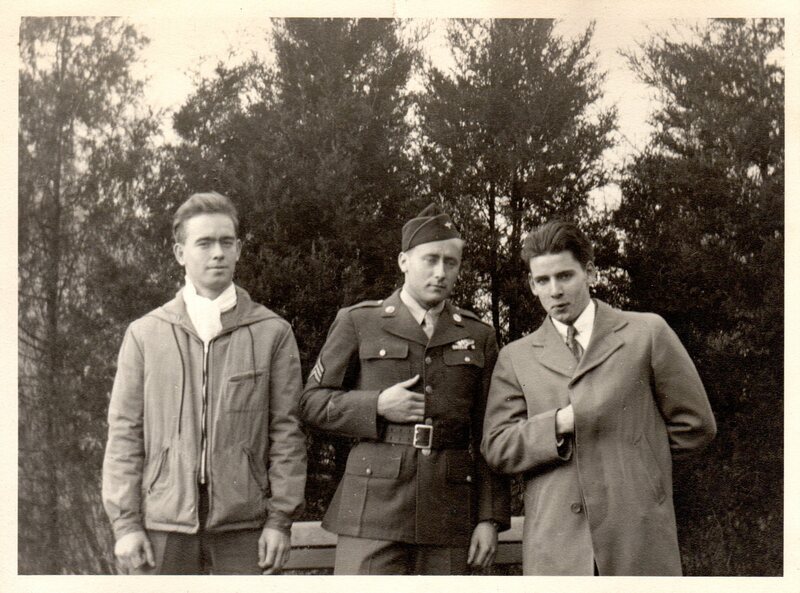 This photo is of my father-in-law Rudy Holmberg on the right (and the youngest), his cousin Lar Conroy in the middle, and their friend Billy Lyne (soon to be Father William). Rudy and Lar both lived in a house in Middletown that included Rudy's mother and sister, Lar's father, and three maiden aunts. Rudy was devastated when Lar was killed in a plane crash during a training flight on a B-17 in 1944. I love this photo. Have they all passed now ? Thank you Diane and Susan. Yes, all 3 are gone now. I love this picture because it shows Rudy’s playful fun side when he was younger and the interaction with Lar. Is your father-in-law imitating Napoleon? I appreciate that your cousin Lars was in the military. 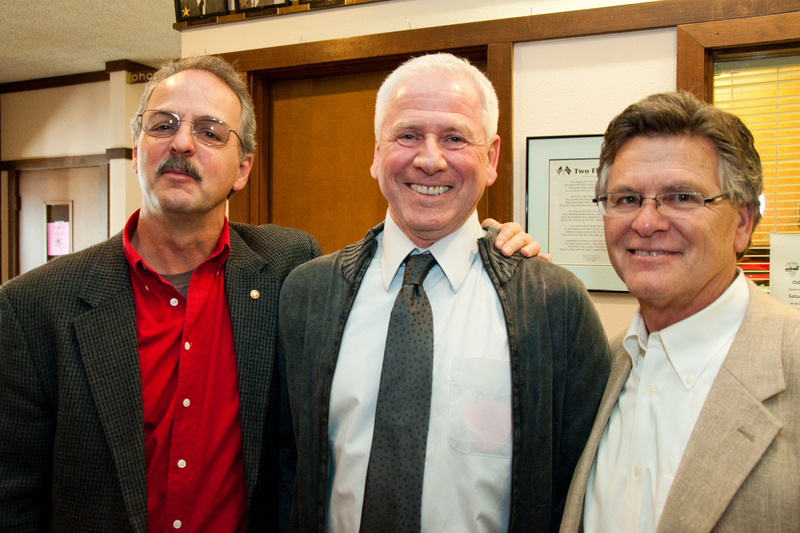 This is a very cute picture of the three men. If was probably much higher for the Soviet Union. Those statistics are definitely interesting. In this case their were 11 from the US Air Force and one RAF officer killed on a flight from Bangor, Maine to Fort Dix when their plane slammed into the side of a mountain. I think they were happiest when they were traveling - camping in this case. just how cute are they? Beautiful photo of your mother friend and wonderful cat. What else in life do you need? 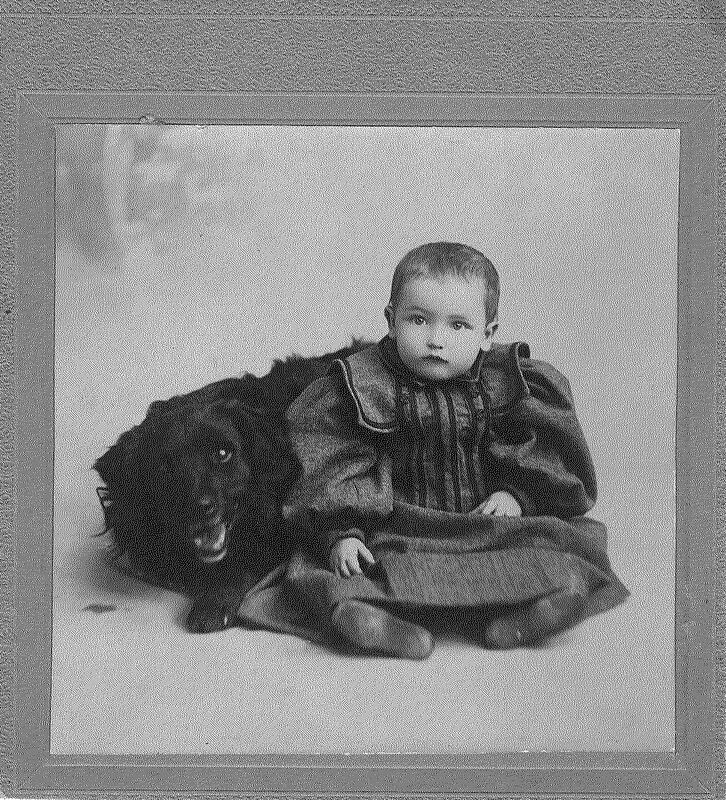 This is a photo of William Arthur Shaules, Jr. with his friend, his dog. William was my husband's 1/2 uncle. Unfortunately, this lovely little boy did not get to grow up with his friend. He died shortly after this photo was taken. But already he had the love of his dog. Sad that they did not get a chance to grow up together. Dog's really are best friend material. I just had a baby and our puppy, who is 1 year old, is so in love with her. She is very protective and happy to just lay next to her all day long. I bet this pup just loved that little boy to pieces. How sad that the little boy died early. And I bet the dog missed him very much when he was gone. 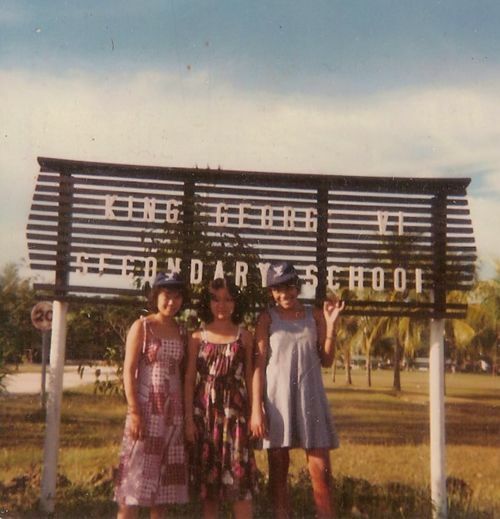 My secondary school friends - from the Solomon Islands - taken in either 1978 or 1979. I would have been 14 or 15 years of age. I'm hiding behind the camera. My family left the Solomons in January 1980 to return home to New Zealand. 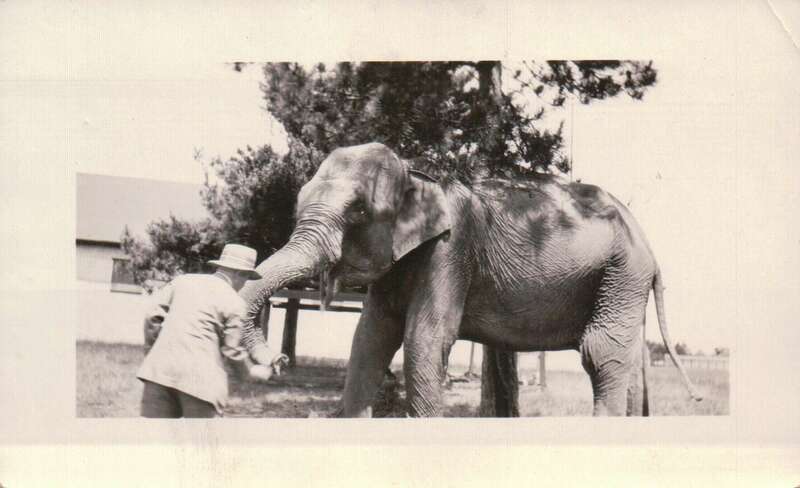 My grandfather loved Circus Animals .. so no surprise that he went to visit the them when the circus came to town. 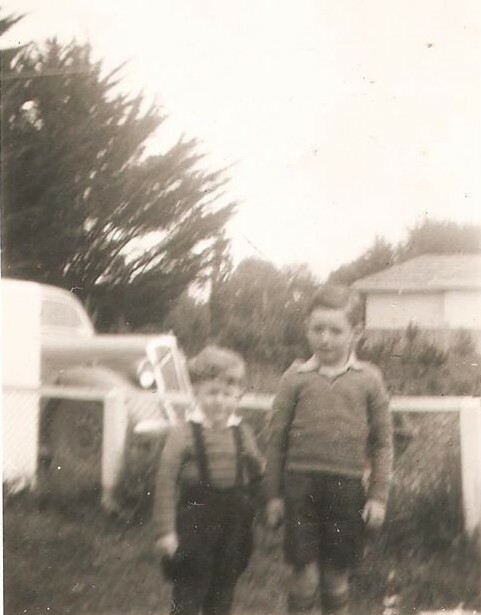 Me and my brother Trevor in 1959. Sorry for the fuzzy Box Brownie photo. The picture is cute, and I remember those cameras. 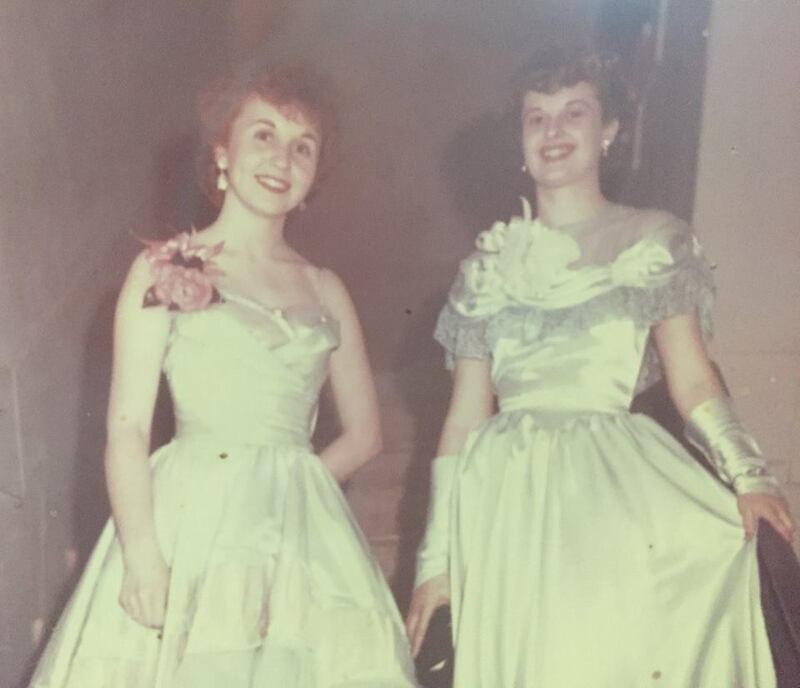 This is my Mom, Mona Ann Osborne (on the right), with a friend. They're all dressed up for a school dance. Thanks Susan! I wish I knew who the friend was! Maybe someday someone will recognize her! Lovely dresses, girls, and corsages. Are they going to the prom? They have big smiles. Bet they had a great time. Thank you, Cheryl! I don't know if it was a prom or a college dance. 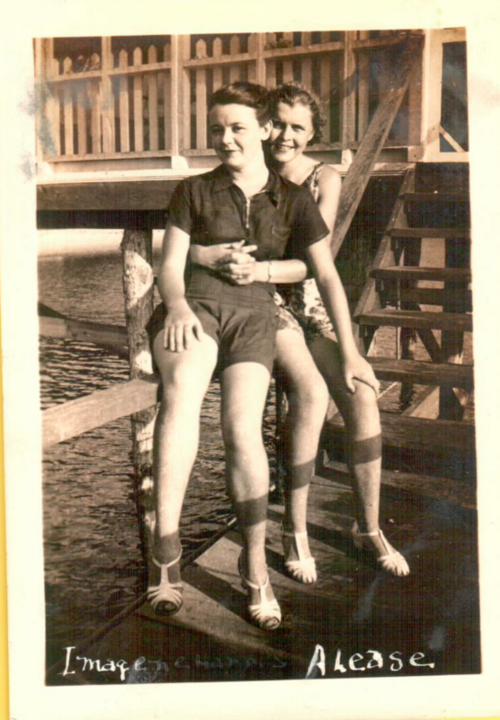 My aunt Mildred (my mother's sister) and her double cousin Alice born a few months apart and were best friends. All the family photos have them standing next to each other, often holding hands, or one with an arm through the other's. 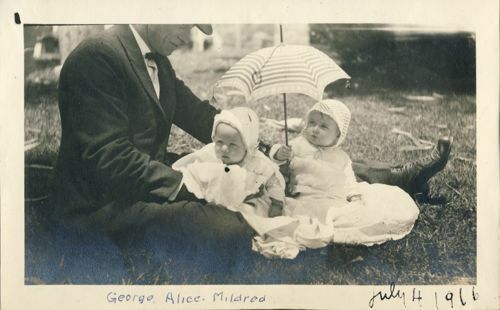 Here is a photo of them as babes, with Alice's father, George. 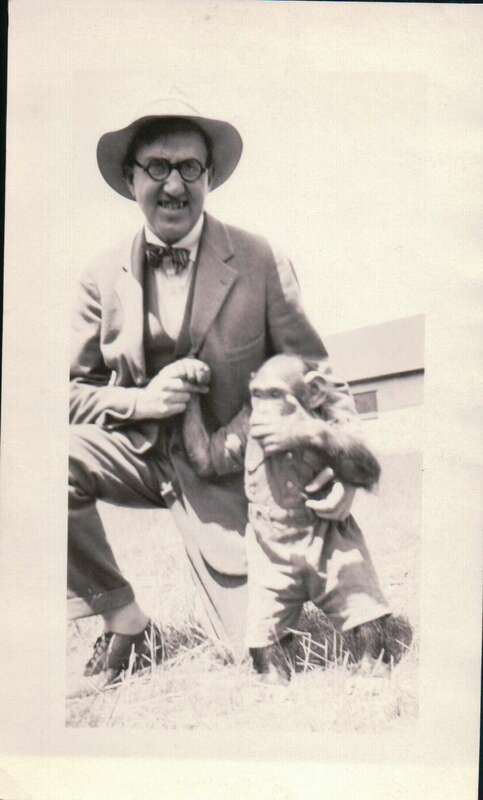 The photo was taken at the Los Angeles zoo, in 1916. 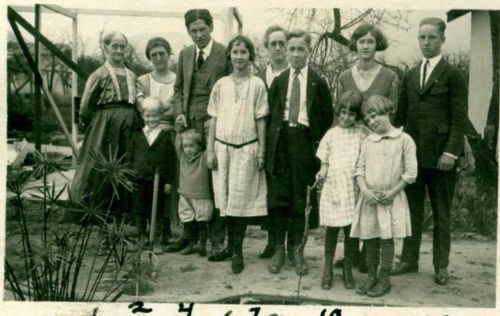 And here is one of them around 9 or 10 years old (around 1926), at a family gathering. The girls are on the far right, in front; Alice on the left, Mildred on the right. Their grandmother, Julia Forrey, is on the far left. 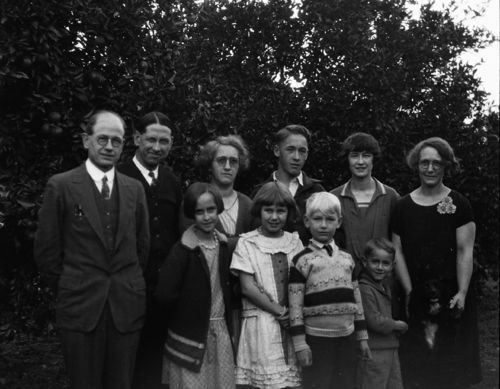 Alice's dad, George, is the tall, dark-haired fellow to Julia's right. Alice's mom, Ethel, is 2nd to the right from George. Mildred's mom, Edith, is between Julia and George. Mildred's father is taking the picture. The grinning, blond-haired imp just to the right of Julia is Mildred's little brother. All the rest are Alice's brothers and sisters. 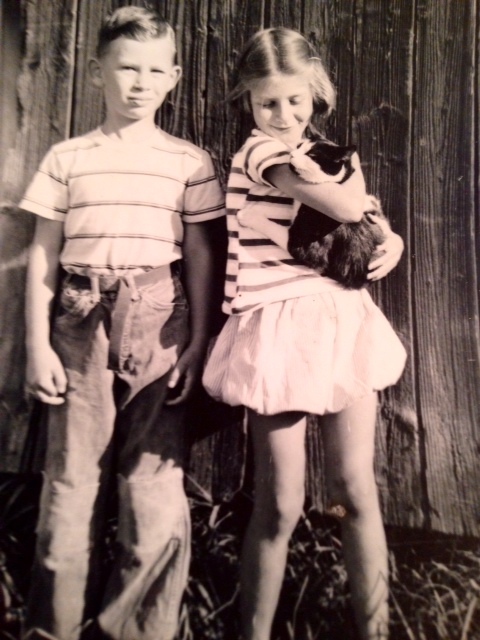 I think this was taken in Pasadena, CA, at my grandparents home, but not sure. They were the best of friends until Mildred moved to the east coast as an adult. Here they are around age 12; front row on the left; Alice on the left and Mildred on the right. To the right of Mildred is her little brother, Willis. 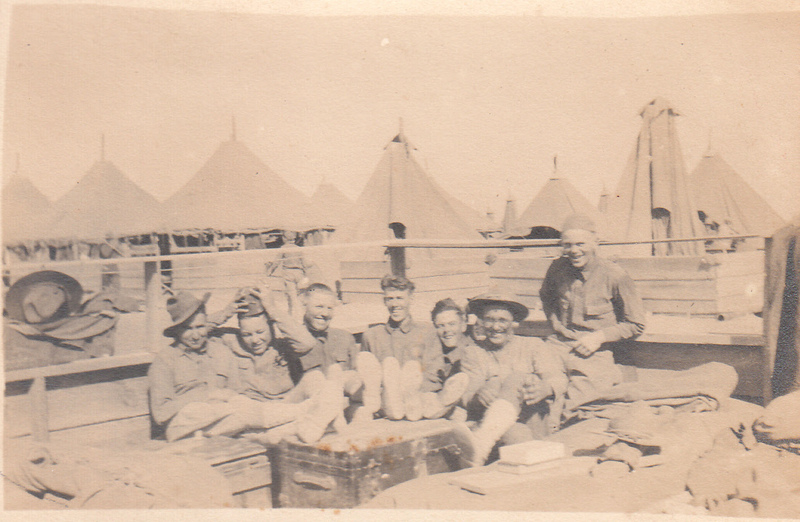 My grandfather, Peter and his brother George are in the back row on the left. To the left of George is his wife Ethel, and her sister (my grandmother) Edith is in the back on the far right. The other children are George and Ethel's. Close families. 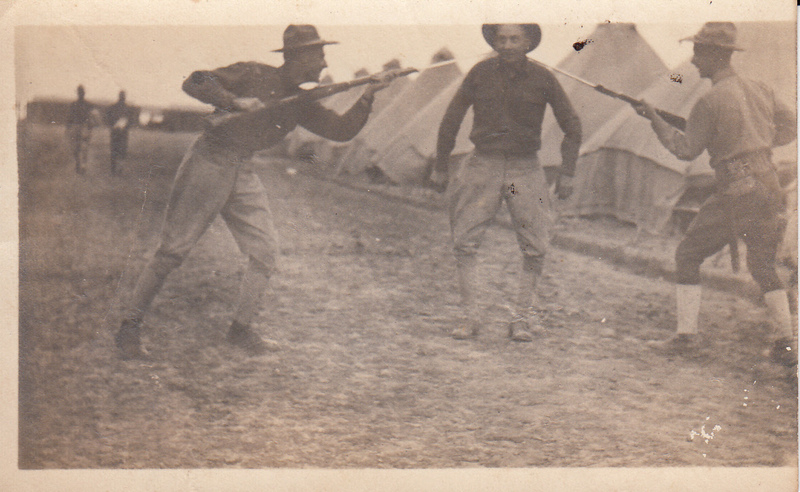 This photo was taken at my great uncle George's orange ranch, in Orange, CA. Those are orange trees in the background, with oranges on them. This is a picture of my Aunts, Jean and Jane. They are twins. 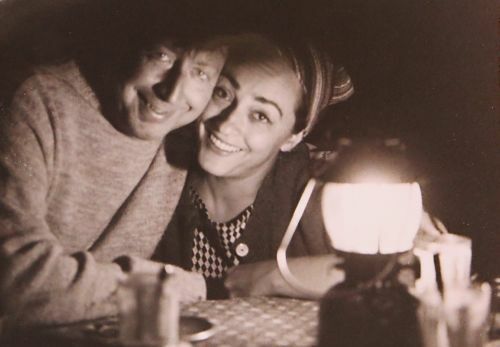 They have done so many things together throughout their lives, and the stories that they have told me are hilarious. 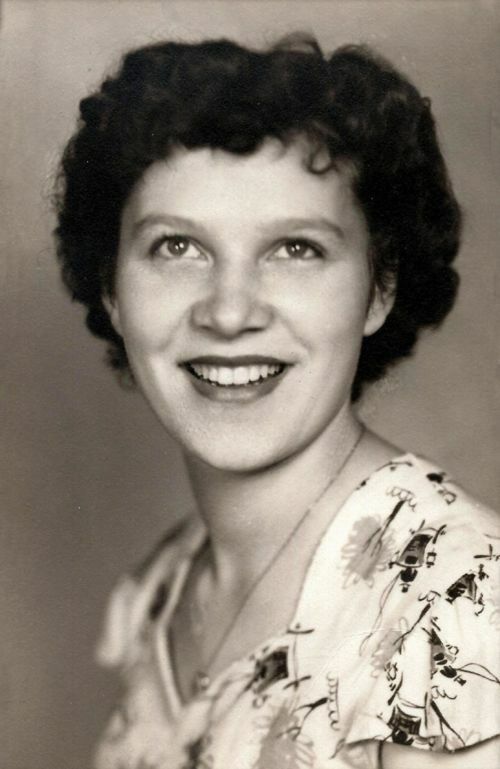 My Aunt Jane worked for my Aunt Jean so she could go on a date. My Aunt Jean went on my Aunt Jane's date for her. They were identical twins and were inseparable most of their lives. That is, until my Aunt Jane moved to Florida. Even then, when something happened to one, the other one knew something was wrong. This was the case on November 27, 2018, when my Aunt Jean had a very bad cold, and started having trouble breathing. We live in Illinois. She was transported to the local hospital, but before we could call my Aunt in Florida, she called us. She had a feeling there was something wrong with her twin. Aunt Jean talked to her on the phone and reassured her that she was alright, and there was no reason for Aunt Jane to come home. Aunt Jean was in the hospital for a couple of weeks, but was home in good time for Christmas. My usual very peppy Aunt Jean had lost a lot of her energy. She was very tired at Christmas and didn't feel up to cooking the family meal. Her daughters pitched in and fixed it for them. But I guess that was even too much for her, because shortly after Christmas she ended up back in the hospital. As we were getting ready to call my Aunt Jane to let her know, she was picking up the phone to call home. She knew her twin was in trouble. She flew home to be with her. She stayed for a week, and was with her twin for 24/7. My aunt was released from the hospital, and her twin went to her house to wait on her. My Aunt Jean just wanted my Aunt Jane to hold her hand. Even in her sleep she called out for my Aunt Jane. Aunt Jane flew back to Florida, because Aunt Jean seemed to be getting better. The picture that I shared was taken on Jan 23, 2019 before my aunt flew back to Florida. Aunt Jean was making a come-back. Her energy level was high. The doctor had her on oxygen, and that was helping her breath. 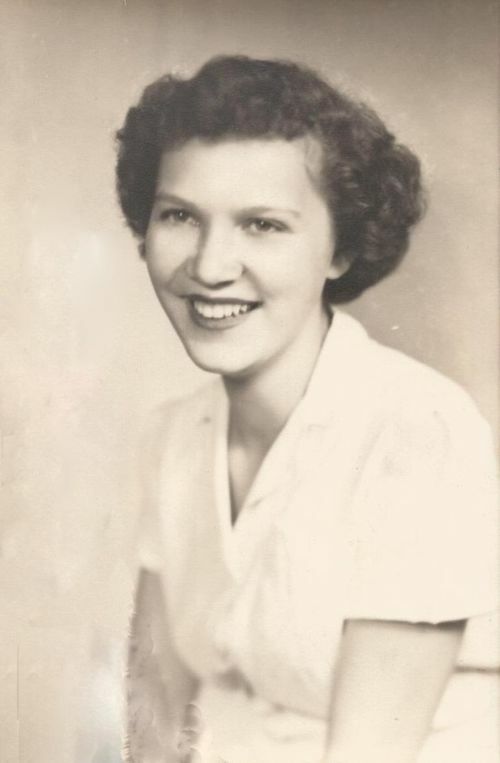 Both of my aunts had started smoking when they were 16, so they had been smoking 67 years, and my Aunt Jean had always had a raspy voice with a cough. But since she was on oxygen, her voice was nice and clear. She went for her Dr. visit and he told her that part of her problem was that she had COPD and her lungs were shot from smoking all of those years. She was supposed to stop smoking (which she didn't), and she was given medication. 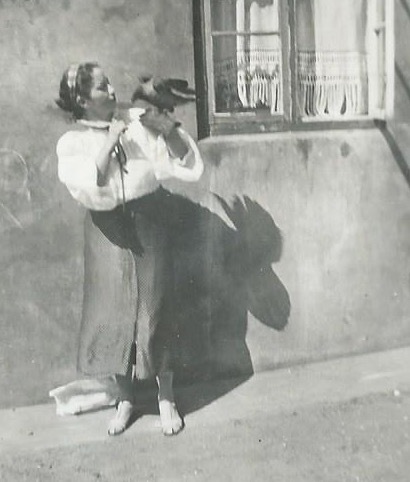 My Aunt Jean's husband died many years ago, and she had a companion that took excellent care of her. In fact, he treated her like a queen. They had been together for 16 years. He was cooking all of the right foods for her, making sure she took her meds and keeping the family up to date on her condition. She was doing really good. Then on February 14th, Valentine's day, she got sick again. She was congested and started having difficulties breathing again. Aunt Jane flew home. She was with Aunt Jean all of the time. Aunt Jean had double pneumonia. She had heart failure and they couldn't do anything to help her, so they sent her home. Aunt Jane was devastated. She didn't leave her twins side. Day and night she sat there and watched her wither into nothing, until Friday, Feb 22, 2019, when Aunt Jean died. Nothing could help Aunt Jane. She was inconsolable. She had never been without her twin. 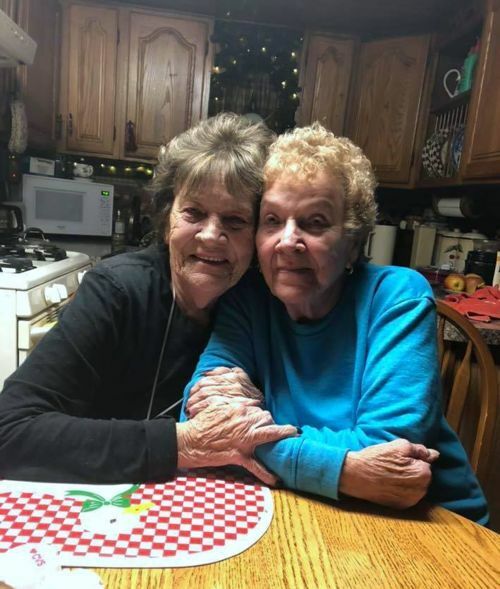 They had been best friends, shared all of their thoughts and secrets through 83 years. They each had two other sisters and a brother that they loved, but their relationship was special, and now it was over. I talked to my Aunt Jane, and she said she had never felt this way before. She had lost a husband and a grandson, but she said losing her twin was like losing the other half of her. They were even in the same hospital in 1963 having children at the exact same time. My Aunt Jean had twins and my Aunt Jane had a daughter that had twins. This was a true friendship that lasted 83 years, and like no other. Beautiful story! Thanks for sharing it, and the photos.